Whether it’s the current research behind ancient Chinese tradition or high-tech prosthetic limbs, a new platform explains the latest doctoral studies from throughout Flanders in videos lasting just three minutes or less. Science Figured Out was created by Scriptie, a non-profit organisation dedicated to promoting science. Each week the platform will present two new videos of researchers explaining what their research is and why it matters, with subtitles in English. The director of Scriptie, Arnaud Zonderman, says Science Figured Out gives the general public greater access to scientific research. One of those studies was conducted by An Verfaillie (pictured), a PhD researcher within the Renewable Materials and Nanotechnology research group at the University of Leuven. 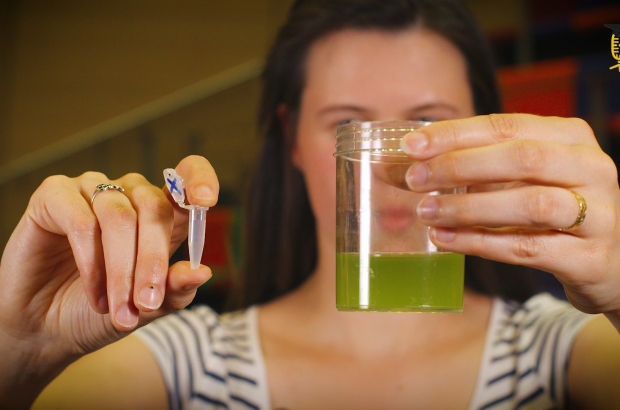 Her work focuses on intensifying microalgae processing to save production costs for plastics, medicine or biodiesel. She appreciates the way the site shows the international presence at Flanders’ universities. While conducting research for her PhD in biomedical sciences and in bioengineering, Hannelore Bové from the University of Hasselt became interested in air pollution and carcinogenic black carbon particles. She says she decided to make her video for Science Figured Out to better communicate with non-scientists. Verfaillie’s and Bové’s videos are two of 15 already published on the site, which is an offshoot of Scriptie’s Flemish PhD Cup, a competition where researchers present their work in just three minutes in the hope of winning a €10,000 prize. The new platform is more inclusive. The organisers provide all the participating researchers with resources and feedback on how and why to pitch their work.